To learn about species population trends, subsequently which shorebird species are at greatest risk, and which habitats they most depend upon. This study will help elucidate the importance of San Francisco Bay and Central Valley wetlands as wintering grounds for shorebirds and other waterbirds along the Pacific Flyway. The annual PFSS will help fill existing information gaps and provide guidance to resource managers on how best to conserve shorebird habitats in the face of environmental change, including urbanization, extreme weather and climate variation, agricultural flooding, and wetland restoration and management. 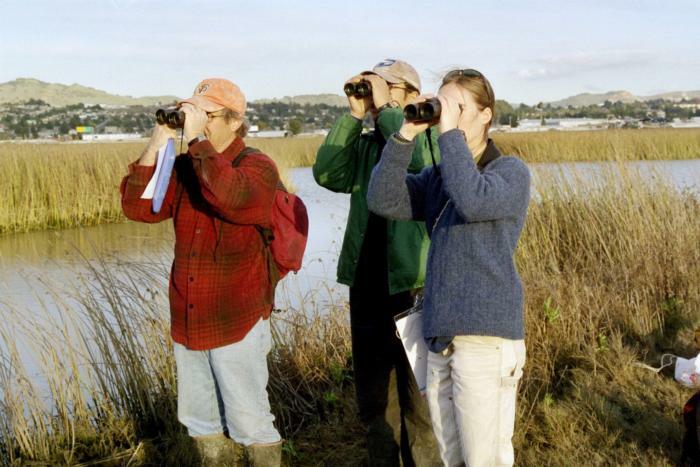 Between November 15th and December 15th, participants scour the San Francisco Bay and Central Valley to count shorebirds. Training: Attend a protocol training session prior to the survey and get your site assignment. Scouting: Become familiar with your site, make sure you know the access points and how long it will take to cover the area. Survey: One day between November 15th and December 15th. 5-6 hours one day for training. Data is currently available online in the Explore Data section. All data is stored in the California Avian Data Center. San Francisco Bay survey data have been integrated with GIS habitat data from the San Francisco Estuary Institute to correlate habitat parameters with the census information. reports and publications produced using the data are available on the project website.